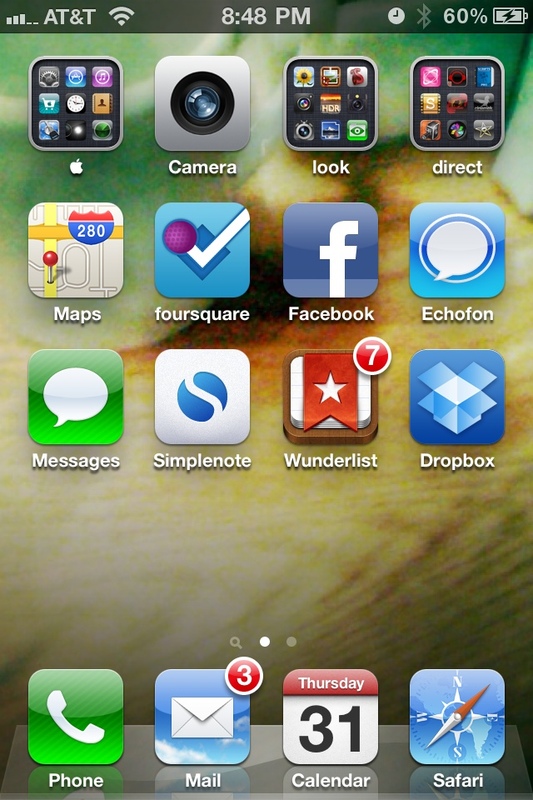 Ben Brooks recently shared his iOS homescreens along with some of his readers’, so i thought i’d join the nerdfest. the rest of the iPhone top row is the Camera and associated photo apps, and my directing tools. while i don’t use my directing tools every day, i do use them every day i’m on set directing, so it saves me from rearranging every time i have a shoot. the whole top row feels like an extension of the info/title bar across the top. the next two rows aren’t in any particular order. the positioning is mainly influenced by association of purpose (Maps and foursquare – location; foursquare and Facebook – apps with personal friends; Facebook and Echofon – social media communication) and where i’ve had apps for years, despite any strategy (Messages and Dropbox). the dock isn’t necessarily the apps i use most (i only use Calendar to add a meeting, so rarely) but they are Apple apps i use most frequently and represent the core purposes of the device. 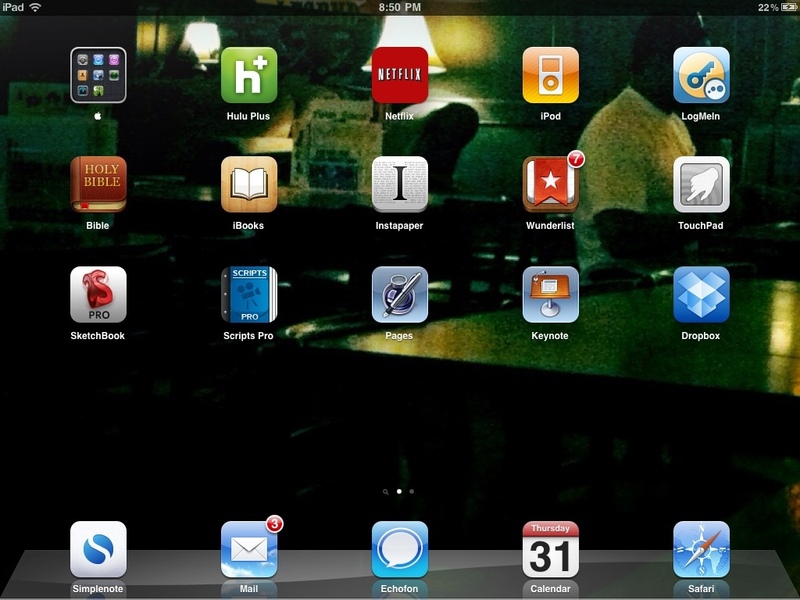 on iPad, the only folder on the home screen is the Apple system folder. everything else is apps i use regularly if not daily. here, the dock DOES have the apps i use most. with my phone, i’m often responding to something — an alarm, a phone call, a text message, twitter. with my iPad, i’m usually taking action — writing, reading, watching, etc. page two is folders, pure and simple. apps are categorized and named by what i will do with the apps inside. the only non-folder icon on page two is the TouchPad. i don’t use it every day, but when i do want to use it, i want to get at it quickly. inside folders, typically frequently used apps come first. secondarily, apps are arranged by the order in which they’ll be used. for instance, in the directing folder, writing apps come before directing, directing before editing, etc. finally, you’ll notice the bottom row is empty. that’s an idea i stole from my buddy Stephen. it makes for clean page turns, even (especially) in jiggle mode. i also think it looks nice. occasionally, i’ll have a movie wallpaper, and a CinemaScope image fits nicely in that space. 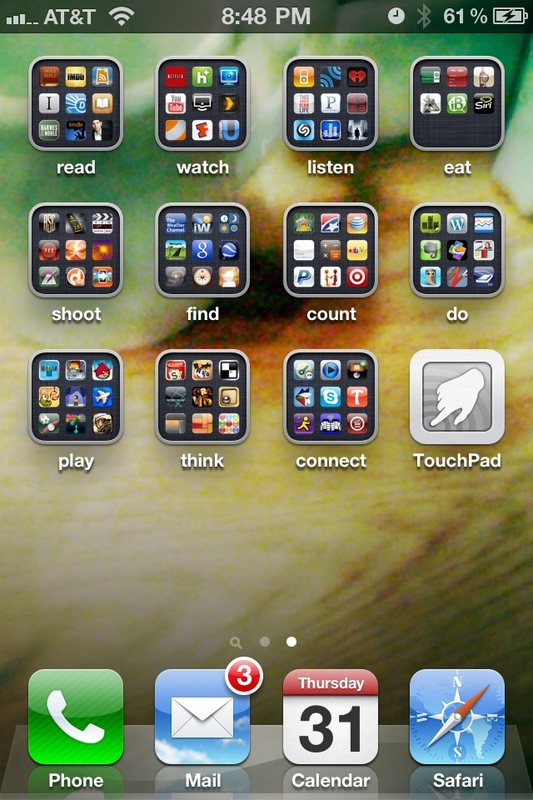 similarly, my friend George has only one row of apps per page to highlight his current wallpaper; he’s a photography nut. so that’s it. just the two pages. sometimes folders get full. i don’t make a new folder (i cheat a little with play/think for games). i decide what needs to go. even when i purchase new apps, the app count on my device rarely goes up. helps me keep everything clean and simple. and above all, they’re guides, not rules. 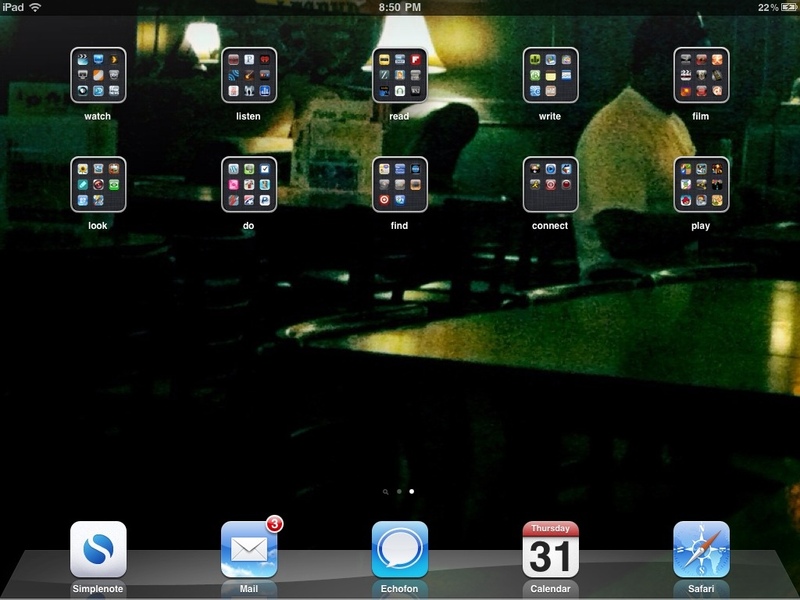 how do you organize your apps? Oh and btw…. When you be in Nashville? tomorrow but I won’t have a car.